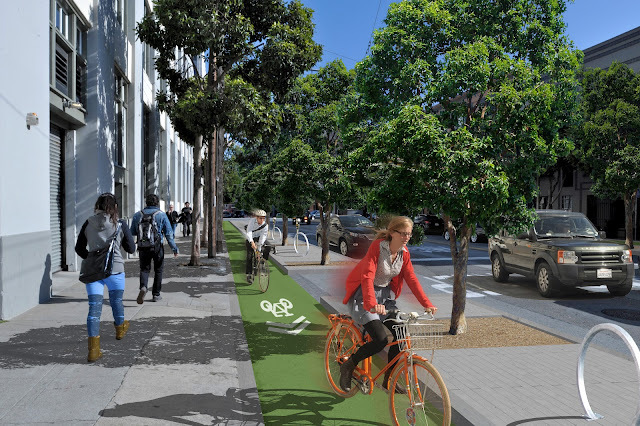 Protected bicycle lanes are great to ride on, and give pedestrians, cyclists, and cars their own space. They also provide space for larger trees than are possible with narrow sidewalks alone. 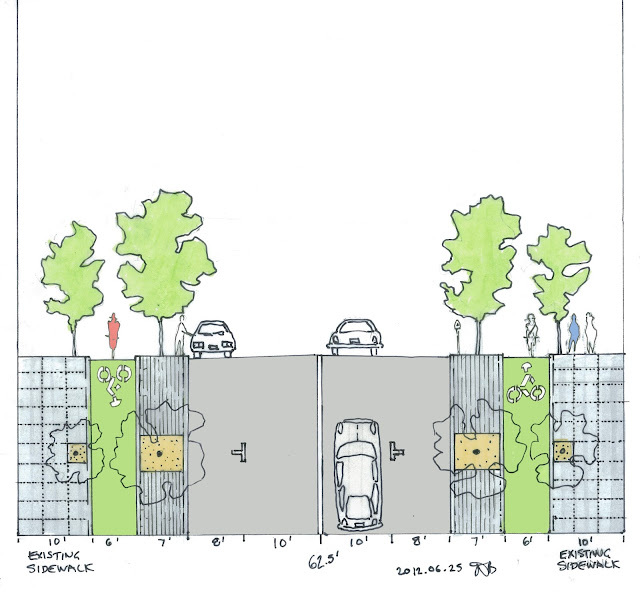 They are an economical alternative to sidewalk widening since they require less infrastructure. Whenever curbs are moved, storm-water drains need to be relocated, which is very costly. Protected Cycle Tracks green and calm Second Street while respecting human powered transport. Existing bleak condition of Second Street. 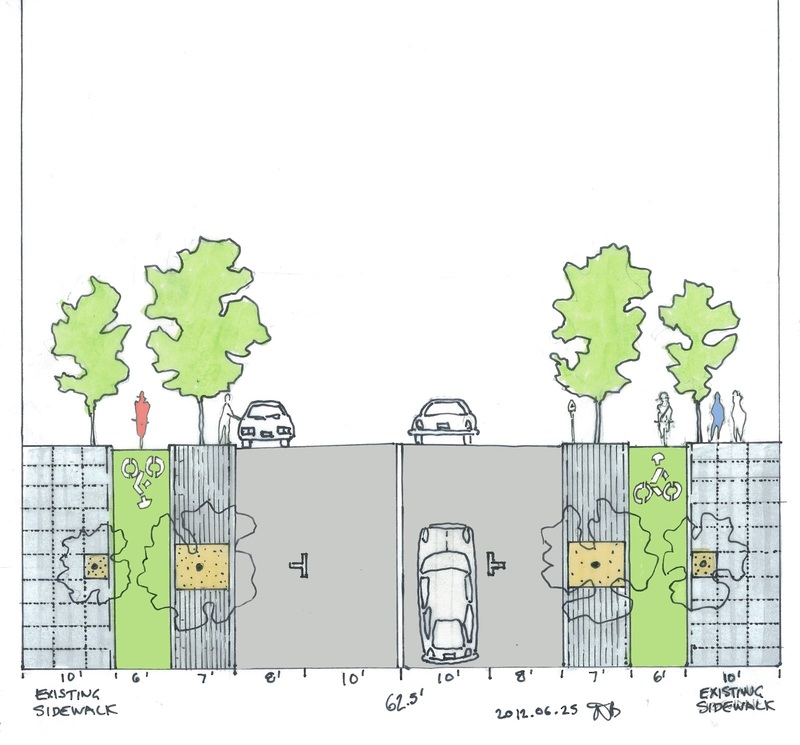 At 62 feet wide curb to curb, Second allows generous cycle tracks and planted buffers. 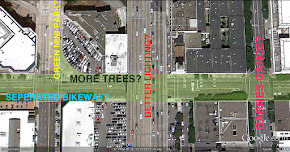 Encouragingly, most of the people at the SFMTA's last meeting were strongly supportive of this option. Hopefully we'll see it happen. I can't wait for this! Right now, biking down Second Street is a harrowing experience at best and feels just like mountain biking. I like it, but there should be more cycletrack width, less green buffer. Cyclists have a 3 foot bicycling shy distance (CROW manual p48). A 6 foot bike lane increases difficulty when passing. That 7' between bike and car seems like wasted pavement. The space is better use to widen the narrow sidewalk, which only allows 2 person walking side by wide. How much nicer it would to walk, especially when there is a Giants game. You're right, except that widening the sidewalk is much more expensive than building a buffer island, even one with curbs, pavers, and trees. This is because when you move the curb out to widen the sidewalk you need to move the storm sewer drains. This is very expensive. 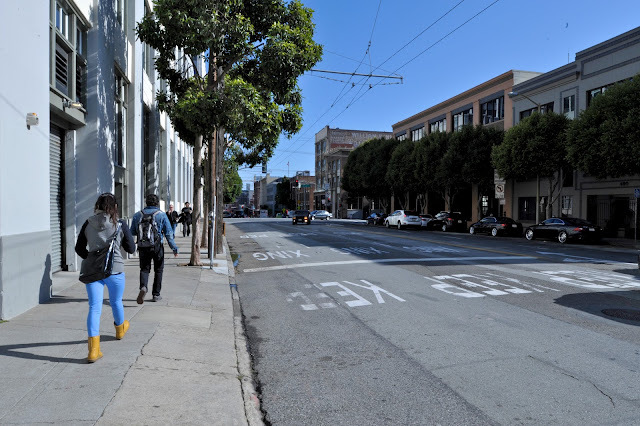 Also things like parking meters, bike racks, and street signs can be moved to the buffer island to free up pedestrian space on the existing sidewalk. Not a perfect solution I agree, but one much more likely to happen for simple budget reasons. It would be a vast improvement for 2nd St. It's a terrible place to ride during commute hours.